are vertebrates. This means they have a backbone or spine. are “ectothermic” or cold-blooded. Ectothermic animals cannot regulate their body temperature, meaning they have to seek warmer or cooler habitats depending on what their body needs. are covered with dry scales. typically lay soft-shelled eggs. However, a few reptiles give birth to live young. have the presence of at least 1 permanent lung unlike their amphibian relatives. are “ectothermic” or cold-blooded. Ectothermic animals cannot regulate their body temperature, meaning they seek warmer or cooler habitats depending on their body temperature. are covered with moist, permeable skin (molecules and gases can pass through). spend part of their lives in water and on land. lay gelatinous eggs in a moist environment. have gills for part of their lives. Flower came to Blandford in 2011. She was an illegal pet that was confiscated by animal control. Her owner did not take proper care of her and she now has serious shell defects and is also missing her right back foot. Pepe came to Blandford shortly after Flower and just like her, he was kept as an illegal pet. He is missing a back leg and was emaciated when he arrived. Our staff nursed him back to health but he can never be released back into the wild due to his missing leg. 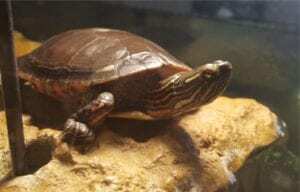 Musk turtles tend to search for food on the sandy bottoms of streams, ponds and lakes. They eat snails, insects, crayfish, tadpoles, small fish and small amounts of plant matter. These turtles inhabit shallow streams, ponds, rivers and shallow areas of clear lakes with sandy bottoms. 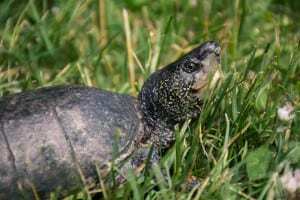 Musk Turtles release an unpleasant odor when threatened. This species is very aggressive and will not hesitate to bite if handled. Willow was discovered in Wyoming, MI in 2004. Her leg injuries have left her with two stumps for front limbs, most likely caused by an attack from either a dog or raccoon. Her injuries prevent her from being able to bury herself and hibernate safely through the winter. Wood Turtles like to eat various types of vegetation growing along rivers and streams such as raspberries, strawberries, grasses, willows, algae and moss. Wood Turtles prefer to live near clear, medium sized streams and rivers with sandy areas for nesting and lots of vegetation for eating. In Michigan, Wood Turtles live primarily in the northern parts of the state. 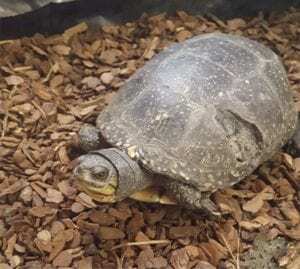 During the winter, Wood Turtles hibernate under ice where the water stays above freezing. They will sometimes hibernate in beaver lodges or muskrat burrows. In addition to vegetation, they sometimes eat dead animals (carrion). Leonardo came in with leg injuries due to a car accident or attack by predators in 2011. Due to his leg injuries, he would not be able to dig into the mud to hibernate during the winter. Painted Turtles eat aquatic plants, insects, tadpoles, small fish, snails, crayfish, and carrion. Painted Turtles prefer bodies of shallow water with muddy bottoms. They can be found in ponds, lakes marshes, slow-moving rivers and streams. Hatchling Painted Turtles produce a type of natural antifreeze to survive the cold temperatures of the fall and winter season while hibernating. Painted Turtles can tolerate organic pollution better than some other turtle species. Brutus was brought in to Blandford in 2005. He was found in Grand Rapids and was missing part of both his back legs and one eye, most likely due to an attack by a predator. Brutus would not be able to properly bury himself for hibernation in the wild. Blandford got Pebbles in 2018 after being kept illegally as a pet. She is missing her front left foot due to an attack by a predator and missed a crucial growing/territory claiming stage of her life by being removed from the wild. Phillip was brought to us in 2012. He was confiscated by a veterinarian who had taken him from a man that had been keeping him as an illegal pet. Under his owner’s improper care, Phillip developed kidney disease so he periodically needs medication for his kidneys. We received Theodore in 2017 as a fully grown adult. He has injuries on both his shell and inner belly, most likely due to an attack by a predator. 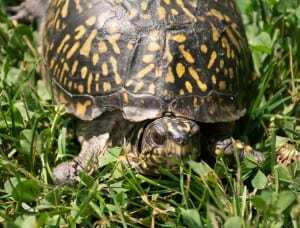 Eastern Box Turtles eat earthworms, insects, slugs, snails, mushrooms, berries, and leafy greens. Young turtles (5-6 years old) eat only meat while adults eat both meat and vegetation. Eastern Box Turtles prefer deciduous or mixed woodlands with sandy soils and access to water. Eastern Box Turtles have a plastral hinge (the front part of the shell on their belly) that allows the box turtle to sick their legs and head into the shell and fold up shut, like a box. 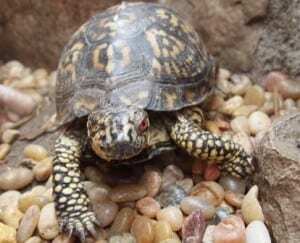 Eastern Box Turtles can live over 100 years! 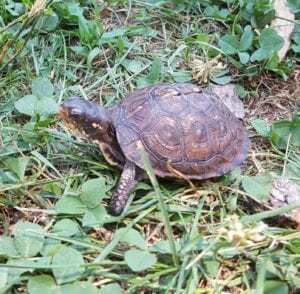 Eastern Box Turtles are protected by Michigan law as a species of special concern. 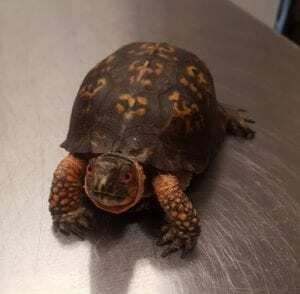 Eastern Box Turtle populations are declining rapidly due to habitat loss, collecting for pets, and road mortality. 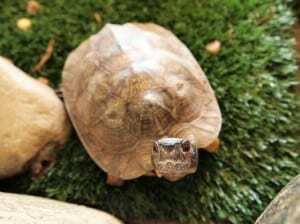 Sweet D was kept as a pet to his previous owner but Blandford decided to keep her as our only pet turtle since 2017 to show the difference between pet species and those that are meant to stay in the wild. 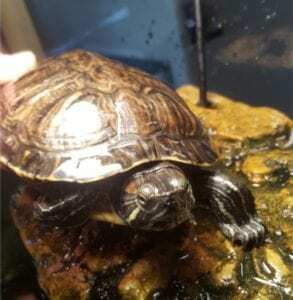 Red-eared Sliders eat mainly plants and small animals, such as fish, crustaceans, and aquatic insects. These turtles prefer calm waters like ponds, marshes, and lakes with soft bottoms and dense vegetation. Although similar to Painted Turtles in appearance, Red-eared Sliders have a red streak on the side of their head unlike the yellow streak of the Painted Turtles. It is the most popular pet turtle in the United States and is also popular as a pet in the rest of the world. Stubs came to Blandford in 2012 after he was likely attacked by a predator and both front legs were reduced to stubs as a result of his incident. Common Snapping Turtles mainly feed on insects, fish, birds, small mammals, amphibians and aquatic plants. 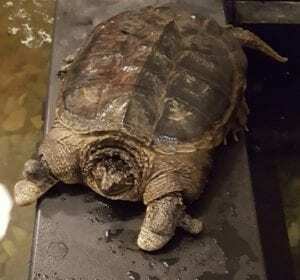 Snapping turtles occupy all types of freshwater habitats (streams, lakes, reservoirs, ponds, marshes, swamps), especially those with soft mud bottoms and abundant aquatic vegetation or submerged brush and logs. The feisty snapping behavior of Snapping Turtles comes from having a smaller plastron (front shell) that leaves them more vulnerable on land. 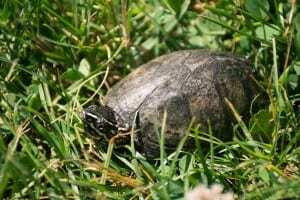 Common Snapping Turtles are most vulnerable as hatchlings but can live up to 30 years. We received Bernadette in 2012 after she was hit by a car in an accident which caused damage to her outer shell. Blanding’s Turtles feed on aquatic insects, fish and fish eggs plus aquatic invertebrates like crayfish, amphibians and aquatic plants are their favorites. Blanding’s Turtles mainly live in wetlands, marshes, rivers, ponds and lakes. Blanding’s Turtles can live to be 100 years old, and are not old enough to have babies until they are 14-20 years old. They can range anywhere from 5 – 10 incles long in size. Blandford staff rescued Tallulah in 2016 after she was accidentally ran over by a lawnmower and lost her left eyelid. Although she has no major injuries, she lives at Blandford to educate populations on native amphibians. Adult toads feed on a variety of insects and invertebrates whereas toad tadpoles feed on aquatic vegetation. The American Toad is found in areas with lots of moisture and plenty of insects. 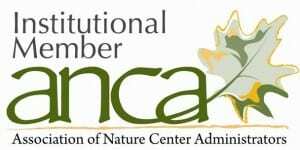 It is often found in parks, yards, farmland, prairies, mountain areas, and forests. Contrary to the myth, toads cannot give you warts by urinating on you. No urine comes out during this defensive strategy but instead just water. 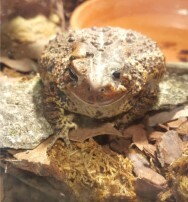 One American toad can eat up to 1,000 insects every day. The main predators to American toads are snakes.